(CBS/WOIO/AP) COPLEY TOWNSHIP, Ohio - Michael Lavery, a former police officer credited with helping stop a gunman who police say killed seven people, says he was terrified but said reacted the way he was trained. "It just comes down to part of my DNA," said Lavery in an interview Monday with WKYC-TV of Cleveland. He lives in the suburban Akron neighborhood where police said Michael Hance went on a shooting rampage. Hance, apparently angry with his girlfriend, gunned down two people outside a home and two more in a car Sunday morning. He then chased down another victim in a rampage that left eight dead, including himself. 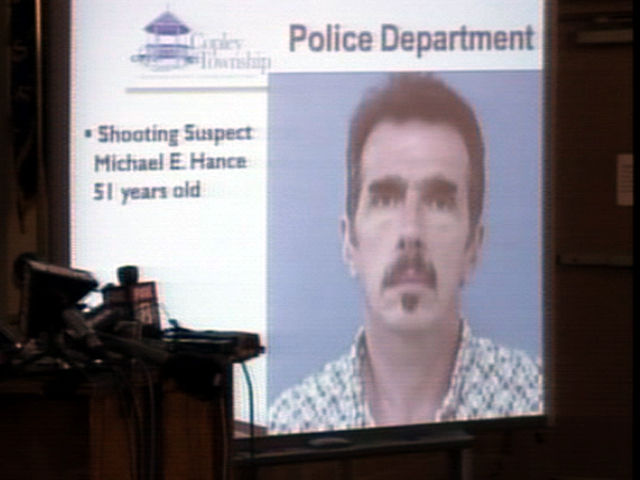 Hance was then shot by police, authorities and witnesses said. One of those victims in the car has been identified as Autumn Johnson. Her father, 44-year-old Bryan Johnson, was also shot and killed. The other victims include Craig Dieter, 51, Russell Johnson, 67, and Gudrun Johnson, according to WOIO. Hance was finally confronted by a Copley police officer and Lavery. Hance threatened the two men and they opened fire and killed him. He had no prior criminal record. Police are still working to determine a motive. Hance had recently grown angry over residents' comments about the property where he lived with Dieter, neighbor Carol Eshleman said. About a month ago, Hance's next-door neighbor Gudrun "Gerdie" Johnson had asked Hance to clean up the property, which included a broken-down car on blocks. Johnson related the encounter to Eshleman, explaining that she'd never seen Hance so upset. "He said, `Get off my property and don't come back,"' Eshleman said. The dispute apparently dated to when Rebecca Dieter's brother, Craig, wanted the house sold, but instead Hance and Becky Dieter moved in, Eshleman said. Another neighbor, Gilbert Elie, said one of the Johnsons had complained about the property to a councilwoman in the neighborhood. Messages seeking comment from Copley Township Trustee Helen Humphreys, who lives nearby, were not returned Monday and it was not clear if there was ever a formal complaint made.